“He is an integral part of making art, even if the brush isn’t in his hand.” Artist George Boorujy provides a perfect introduction for William Louis-Dreyfus. Besides being a businessman with a net worth of over $3.4 billion, William is a passionate art collector. For over 50 years, he has been supporting and encouraging artists, growing his collection to over 3,500 sculptures, paintings and drawings. Born in France, his keen eye for art has been nurtured ever since he was a child. However, what’s more incredible than the collection itself is his integrated passion for justice, education and art, along with his ability to connect these into a single act of generosity. William has shown a very keen philanthropic interest in the education of African-American children of Harlem through the organization Harlem Children’s Zone. These kids are increasingly exposed to lives of crime and violence that starts when they are born. Providing them with guidance and a good education could break the vicious circle. The goal is to successfully support a group of children from birth through to their college graduation but one of the biggest challenges is funding the effort today and providing sustainable funding for the future. The ability to promise support for over 300 children through 21 years of their lives needs a stable long-term financial investment. William’s art collection of personally chosen works from across the world with growing financial value allowed him to provide the stability in investment that these children needed. His collection is defined by a common theme of homage to the physical act of doing art and to the heart and hand that makes it, being noticeably rich in color and lack of minimalism. A great depth in variety is clear with works ranging from artists such as Leonardo Cremonini, Catherine Murphy, Dee Shapiro to Stone Roberts, Raymond Mason and Robert Birmelin. William is also known for his ability to identify talent and has a keen interest in Outsider Art, owning captivating works by Bill Traylor, James Castle and Thornton Dial, of which some are even made of scrap metal and wires. Artists claim that it is his open mindedness and ability to appreciate their perspective and efforts that make his collection as personal and unique as it is. Together, his collection, which he has recently donated to the Harlem Children’s Zone, has an estimated current value of $10 million, which is expected to rise over time. William Louis-Dreyfus says that he believes in correcting the wrongs of slavery and balancing out the slate by paying back African-Americans for their contribution to the success of this country. For him, investing in the positive future of these children is an ideal way of doing so. 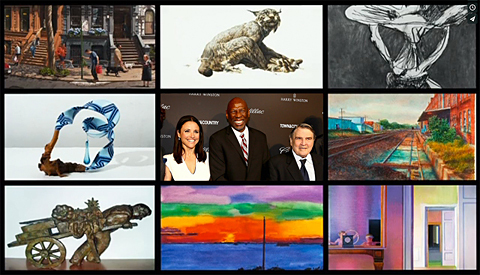 We at A Street Frames have been very fortunate to be a part of William Louis-Dreyfus’s art collecting. Mark LeSaffre, owner of A Street Frames, shares a story about this, “Over the past 4 years, his curators have sent us well over 100 pieces to frame. The first group, about 30 paintings, was on slate roofing shingles and the material was fragile and irregular. It was our job to design a method of display that would not intrude on the visual nature of the slates themselves. Our solution was to fabricate hundreds of small brass mounts, painted to blend with the art, that held the edges of the tiles and allowed them to be hung on the wall as though they were floating. The ability of art to provide for and be the means of salvation for the Harlem Children’s Zone makes for a truly magical story. His daughter, Julia Louis-Dreyfus (best known for her role in Seinfeld), showcases her father’s efforts in the documentary Generosity of Eye: www.generosityofeye.com.